My primary health problems were not sleeping well and seasonal allergies. With chiropractic, I do not take any prescription medications and I’m able to fall asleep and stay asleep!– Lorelle B. An absolutely enjoyable hour and a half every time I have a massage. Entire staff is great!– John A.
Noah said he had a dream today at Dr. Bill’s on the table. He said “there were hearts running all around the room, and whoosh, they went in my chest and brain.” He said, “Mom, my chest was just rising and rising.” I asked him if it was good, and he replied, “Oh, yes!” I’m so happy for him!– Noah W.
Now that I have been in the care of Dr. Bill for a little while, I have noticed an increased awareness of my body. I can often allow my body to work through discomfort with relaxation and deep breathing instead of taking OTC medications. I love the couple’s massage too!– Michelle M.
Chiropractic has been a big benefit for my overall health and has also prevented numbness in my right arm from reoccurring.– Art M.
I can’t say enough about the entire staff at The Family Wellness Center. They went above and beyond to support the mission of Capital Area Girls on the Run by organizing their fabulous Winter Wellness Day fundraiser on our behalf. The effort they put into preparing for Winter Wellness Day and making everybody feel welcome was extraordinary and speaks to their desire to give back to the local community. They are true professionals as well as wonderful people!– Brandi Berwager, Council Director, Capital Area Girls on the Run. My general pursuit of being “well” nudged me into the Center, and quite honestly, I never gave it a though that my hip issue might have anything to do with misalignment. Fast forward and the hip pain is gone! What a difference it makes to keep tuned up.– Bob J. The Sugar Detox was totally life changing! My sugar cravings are gone!– Jeneen M.
I honestly cannot picture my health being so wonderful without chiropractic! I enjoy seeing Dr. Bill immensely and value my adjustments. I would be silly not to!– Norah R.
At its worst my pain was so bad it affected my ability to walk, sit or stand comfortably. Nothing was helping and I was heavily frustrated. Now my symptoms are all but gone. I’m learning how to listen to my body and just enjoy life!– Ann R.
It’s ALL great! I love everything!– Sheila F.
I leave here craving to come back. I just couldn’t wait to come back! I leave wanting more and Tiffany does a really good job!– Margo W.
I was introduced to Chiropractic care at a wellness workshop. I like the gentle approach that Dr. Bill offers and the emphasis on wellness and spirituality. I also like that the office staff are very nice and friendly and the office is very clean!– Carol H.
Coming to Dr. Bill has greatly improved my life. I have such a positive feeling about improving my life with each chiropractic adjustment. My back pain that I was experiencing is no longer keeping me up at night.– Nancy K.
Being in Chiropractic Care with Dr. Bill, my vitality and vibrancy has increased and I have a much greater sense of well-being. My movement is much better, I seem to be standing stronger than I used to.– Barbara O.
I’ve been coming to Dr. Bill since 2009 due to neck pain. My weekly visit has been such an awakening and a very positive experience. I no longer have the pain and no longer suffer from sinus problems. Dr. Bill and his staff are a group of warm, wonderful, and caring team. They do care so much about one’s health and well-being.– Jane M.
The caring staff, the flexible adjustment times, the relaxed and friendly atmosphere, and the informational workshops make this the ideal place to achieve my health and wellness goals now and in the years to come. I have been really, really pleased with the results.– Carol S.
It all works! My health and symptoms have improved so much that I no longer take any prescription medications. Most notable improvements include: posture, much less upper back and shoulder pain, greater range of motion and much less hip pain.– Jackie D.
This place is a hidden treasure! I feel I have benefited physically and mentally from the services at the center. I’ve become healthier, wiser, more spiritual and an overall ‘whole’ person.– Sri K.
I have more energy, sleep more soundly, overall feel better, lighter and less burdened since coming to the center.– Jill B. Almost immediately I noticed a change in my total well-being and the minor health-related conditions I have.– Fredricka M.
I look forward to my visits to the center and have a great deal of calmness in my life for the first time.– Jane R.
I can’t tell you enough how much it means to me, to be getting the help I’ve been searching for, for years. I finally have some hope to get my health back, one day soon, where I can live without aches and pain! And to be able to finally move forward with my life in good, positive ways! God bless ALL of you! -Sue H.
I have experienced huge improvement in my general comfort level and range of motion. I’d been to other chiropractors but it was always just a quick fix. Now I can exercise again, for the first time in years. I am much, much better! I love the healing environment. Dr. Bill lives his talk and knows how to encourage, challenge, listen, and educate. Thanks so much!– Carolyn L.
Thank you so much for everything I have learned in the Sugar Detox Program. I am loving the smoothie recipes you gave us, especially the purple, chocolate, green one and the peanut butter carob one!– Michelle B. With chiropractic, I am able to get out of bed in the morning and go to work. Some mornings I could not do this before. All the staff treat me very well and always encourage me.– Peggy M.
After experiencing severe whiplash from an accident, I came to the Wellness Center for massage therapy. The natural healing through massage has been very effective and has brought healing naturally without needing prescription drugs. The staff is always friendly and welcoming to all their clients. 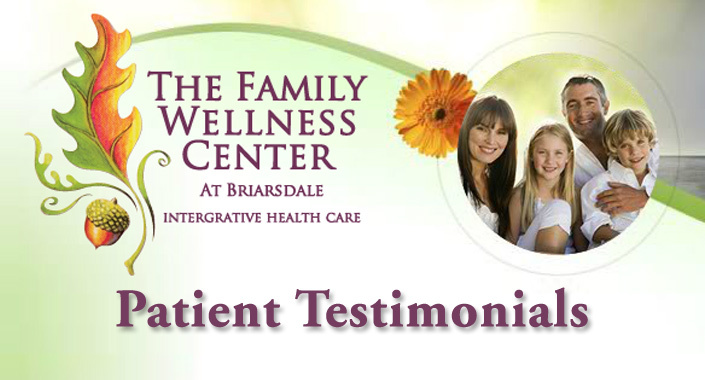 The Family Wellness Center has helped me make many positive changes in my life. The support of Deb Coulston and her staff are invaluable. I have learned a lot about nutrition and treating the body and mind holistically. The staff at The Family Wellness Center have saved my life. You have to be willing to follow the suggestions—and I find when I do, my mood is better and my health is better. Every staff person is caring and courteous. This has become my second home. Ready to get started? Call The Family Wellness Center to schedule an appointment!